As the obesity and diabetes epidemics continue to soar, the blame for our expanding waistlines and declining health is frequently pinned on sugar. The problem is that when people think of “sugar,” they think of the added sugar in foods that are associated with weight gain, such as soda, cake, and candy. However, there are many different types of sugars – both naturally occurring sugars in fruit and vegetables, and added sugars in processed foods. Most people don’t really need to consume any added sugar; the natural sugars in fruits, vegetables and dairy products are sufficient. InsideTracker can tell you if your blood glucose levels are healthy, so you can adjust your sugar intake accordingly. This blog post is the first part of a two-part series that deals with the subject of sugar—this post will explain the role of sugar in energy metabolism and different type of sugar, and the second post will explore how sugar is related to the glycemic index (a measurement of how quickly blood sugar levels rise after eating certain foods). How does your body use sugar in food? All sugars are carbohydrates, compounds in food that provide your body with an ample supply of glycogen, which is your body’s primary fuel source. Muscles primarily rely on carbohydrates for fuel, so they play an important role in helping you to stay alert, focused, and energized during your workouts. Click here to learn how InsideTracker can help you monitor and optimize your glucose levels and recommend delicious whole foods! Carbohydrates are divided into two categories, simple (sugar) and complex (starch), which are classified according to their chemical structure and how quickly the body digests and absorbs the sugar. 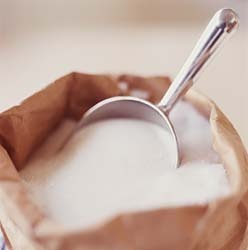 This article focuses on simple sugars, which are often vilified by the media as the cause of weight gain. Simple sugars are fairly easy to digest; your body breaks them apart and they are absorbed into your blood stream via the small intestine. Any sugar that your body doesn’t use for fuel is converted into fat and stored in your cells. Fruit contains a simple sugar called fructose, which is one of the sweetest simple sugars. In addition to sugar, fruit also is a good source of many different types of vitamins, minerals, and fiber. The fiber is an especially important component of fruit because it works to slow the digestion of food, which prolongs the release of sugar into your bloodstream. This makes energy available for longer periods of time, eliminates “sugar rush”, and reduces the quick conversion of glucose into fat because fruit is much less calorie-dense than other types of sugary foods. Watch out for fruit juices though—many brands lack fiber and contain lots of added sugars. Dairy products contain lactose, another form of simple sugar. Although it is less sweet than fructose, lactose also works to provide energy to your body. While dairy products are generally not good sources of fiber, they do contain ample amounts of protein, which also works to slow digestion and prolongs the release of sugar into the blood. However, not all dairy products are created equal: some brands of yogurt, ice cream, and flavored milk contain added sugars that your body doesn’t need. Processed foods like candy, cake, syrup, fruit juices, carbonated beverages, and many brands of cereals contain refined simple sugars. If you look at the labels of these foods, you will find simple sugars like high-fructose corn syrup, brown sugar, table sugar, malt syrup, and molasses listed among the primary ingredients. Unless these foods are fortified or enriched (which means that nutrients are added to the product by the manufacturers), these products are considered to have “empty calories”, or sugars that don’t come with the fiber, minerals, or vitamins that you’ll find in fruit and dairy. It depends on how much and what type of sugar you eat! Your body needs a fairly constant level of sugars in your bloodstream in order to provide energy to your muscles. Basically, when you eat simple sugars, you convert sugars in excess of your cells’ immediate energy needs into molecules called trigylcerides, which are the chemical form of most fats in your body. Your body stores these triglycerides and releases them on an as-needed basis. So, while excess sugar can contribute to weight gain, you need to have some stored fat for energy reserves! The bad news is that most of the sugar we eat comes from soft drinks and candy, instead of from whole fruits, vegetables and milk. In fact, the average American consumes about 22-28 teaspoons of added sugar each day, which is roughly 350-440 empty calories that can result in excess fat. In response to this, the USDA Dietary Guidelines for Americans recommends that added sugars constitute no more than 10% of our total caloric intake (that’s between 6-9 teaspoons per day). However, the Guidelines also emphasize that these sugars should originate from fruits and low-fat dairy sources because these foods also contain important vitamins and minerals. Essentially, a little added sugar is okay, just be sure that most of the sugar that you’re eating comes from fruits and dairy products!